People have been using spices for thousands of years. Often they wanted ones that didn't grow near them, so they got them from far away. 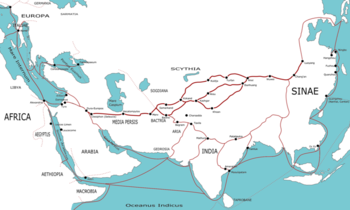 One of the biggest spice routes was a route between Asia and Europe. Only a few spices grew in Europe, so the others had to be brought from Asia. People made a route to go from Europe to Asia to buy spices. The route was very difficult and so the spices were expensive. People tried to find ways cheaper than the spice route, including going the other way around the world. This made the Age of Discovery, when they found places that they didn't know about, such as the Western Hemisphere. Countries traded spices for gold and other things. They did this so they could get new spices or gain money and gold by selling their own. Sometimes people traded the spices because their country is running out of that certain spice. This page was last changed on 27 January 2019, at 16:36.